Specialises in applied microeconomics, development, environment and teaching economics. Current research interests: Applications of microeconomic models and quantitative techniques to business and both primary and secondary industries, trade and development issues including productivity growth, income distribution and poverty; Ecological, environmental and sustainability issues; Economics of aquaculture; Teaching economics. Has co-authored and co-edited several books published by internationally reputed publishers. Published more than 50 articles/book chapters. 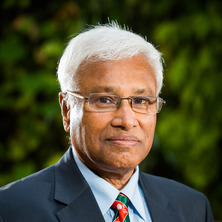 Many of his articles have been published in internationally reputed journals including Agricultural Administration, Applied Economics, Australian Economic Papers, Development and Change, Economic Development and Cultural Change, Economic Papers, Food Policy, Journal of Development Economics, Journal of Development Studies, Journal of Environmental Economics and Management, Oxford Bulletin of Economics and Statistics and World Development. His research has been funded by ILO, ARC and ACIAR grants. Bangladesh Yesterday Today Tomorrow: Essays in Honour of Professor Sanat Kumar Saha. Edited by Alauddin, Mohammad, Mujeri, Mustafa K and Nath, Dilip Kumar Bangladesh: Mofidul Hoque, 2016. Alauddin, M. and Hossain, M. Environment and Agriculture in a Developing Economy: Problems and Prospects for Bangladesh First ed. UK: Edward Elgar, 2001. Development, Governance and the Environment in South Asia: A Focus on Bangladesh. Edited by M. Alauddin and S. Hasan Great Britain: MacMillan, 1999. Alauddin, Mohammad (2004). Bangladesh's Agriculture in Reform Mode: Experiences, Obstacles and Prospects. In M. Battacharya, R. Smyth and M. Vicziany (Ed. ), South Asia in the era of globalization : trade, industrialization and welfare (pp. 145-163) New York, N.Y., U.S.A.: Nova Science Publishers. Alauddin, M. (2004). Recent Developments in the Bangladesh Economy. In Raghbendra Jha (Ed. ), Economic Growth, Economic Performance and Welfare in South East Asia (pp. 11-27) Houndmills, Basingstoke, Hampshire ; New York: Palgrave-Macmillan. Alauddin, M. (2003). Trade and Regional Integration issues for Bangladesh: Predicaments and Prospects. In Hossain, M., Nurun Nabi, A.K.M., Islam and I. (Ed. ), Bangladesh's Development Agenda and Vision 2020: Rhetoric or Reality? 1st ed. (pp. 91-107) Bangladesh: The University Press Limited. Alauddin, M. and Hamid, M. A. (1999). Coastal aquaculture in South Asia: Experiences and lessons. In Mohammad Alauddin and Samiul Hasan (Ed. ), Development, governance and the environment in South Asia: A focus on Bangladesh (pp. 289-299) Great Britain: MacMillan. Alauddin, Mohammad and Hasan, Samiul (1999). Development-governance-environment nexus: Views, perspectives and issues. In Mohammad Alauddin and Samiul Hasan (Ed. ), Development, governance and the environment in South Asia: A focus on Bangladesh (pp. 1-16) Great Britain: MacMillan. Alauddin, M. and Hamid, M. A. (1999). Shrimp culture in Bangladesh with emphasis on social and economic aspects. In P. T. Smith (Ed. ), Towards sustainable shrimp culture in Thailand and the region (pp. 53-62) Canberra: Australian Centre for International Agricultural Research. Alauddin, M. (1999). South Asia's experiences, challenges and prospects in global context. In Mohammad Alauddin and Samiul Hasan (Ed. ), Development, governance and the environment in South Asia: A focus on Bangladesh (pp. 315-331) Great Britain: MacMillan. Jahan, N., Alauddin, M. and Tisdell, C. A. (1999). Structural reforms in Bangladesh: Their impact on efficiency in resource use, equity and the rural environment. In R. Shand (Ed. ), Economic Liberalisation in South Asia (pp. 436-464) New Delhi, India: MacMillan. Alauddin, M. (1999). Trade among South Asian nations: Experiences and prospects. In M. Alauddin and S. Hasan (Ed. ), Development, Governance and the Environment in South Asia (pp. 117-139) Great Britain: MacMillan Press. Jahan, N. and Alauddin, M. (1999). Women and the environment with special reference to rural Bangladesh. In M. Alauddin and S. Hasan (Ed. ), Development, Governance and the Environment in South Asia: A Focus on Bangladesh (pp. 301-313) Great Britain: MacMillan. Alauddin, Mohammad and Tisdell, Clem (2011) Quantitative impacts of teaching attributes on university TEVAL scores and their implications. International Journal of University Teaching and Faculty Development, 1 2: 71-88. Alauddin, Mohammad and Nghiem, Hong Son (2010) Do instructional attributes pose multicollinearity problems? An empirical exploration. Economic Analysis and Policy, 40 3: 351-361. Hossain, M.A. and Alauddin, M. (2005) Trade Liberalisation in Bangladesh: The Process and its Impact on Macro Variables Particularly Export Expansion. Journal of Developing Areas, 39 1: 127-150. Alauddin, M. and Khandaker, S. A (2004) Economic Impact of E.coli 0111 Outbreak in 1995 in Australia. American Jornal of Applied Sciences, 1 4: 302-308. Alauddin, M. and Butler, J. E. (2004) From a Vicious Circle of Anxiety to a Virtuous Circle of Learning: Experience of Teaching to a Heterogenous Clientele. American Journal of Applied Sciences, 1 3: 202-208. Alauddin, Mohammad and Valadkhani, Abbas (2003) Causes and Implications of the Decline of the Economics Majors: A Focus on Australia. Journal of Economic and Social Policy, 7 2: 68-90. Alauddin, M. and Tisdell, C. A. (2000) Changing academic environment and teaching of economics at the university - level: Some critical issues analysed with the help of microeconomics. Economic Papers, 19 1: 1-17. Tisdell, C and Alauddin, M (1992) The Ishikawa Curve and Agricultural Productivity in Bangladesh - Some New Findings. Hitotsubashi Journal of Economics, 33 1: 113-127. Alauddin, M. and Tisdell, C. (1991) The "Green Revolution' and labour absorption in Bangladesh agriculture: the relevance of the East Asian experience. Pakistan Development Review, 30 2: 173-188. Alauddin, M and Tisdell, C (1986) Decomposition Methods, Agricultural Productivity Growth and Technological-Change - a Critique Supported by Bangladeshi Data. Oxford Bulletin of Economics and Statistics, 48 4: 353-372. Alauddin, Mohammad, Amarasinghe, Upali A. and Sharma, Bharat R (2010). Are there any ‘bright’ spots and ‘hot’ spots of rice water productivity in Bangladesh? A spatio-temporal analysis of district-level data. In: 2010 Oxford business economics and conference program. 2010 Oxford business economics and conference, St Hugh's College, Oxford University, Oxford UK, (). 28-30 June 2010. Alauddin, Mohammad, Amarashinghe, Upali A. and Sharma, Bharat R. (2014). Four decades of rice water productivity in Bangladesh: A spatio-temporal analysis of district level panel data. School of Economics Discussion Paper Series 518, School of Economics, Universit of Queensland. Alauddin, Mohammad and Ashman, Adrian (2014). The changing academic environment and diversity in students study philosophy, beliefs and attitudes in higher education. School of Economics Discussion Paper Series 511, School of Economics, University of Queensland. Alauddin, Mohammad and Bharat, Sharma R. (2013). Inter-district rice water productivity differences in Bangladesh: An empirical exploration and implications. 517, School of Economics, University of Queensland. Alauddin, Mohammad (2011). What They Think, What They Expect, and What They Practise: A Multivariate Analysis of Students′ Perceptions about Teaching and Learning in Higher Education PhD Thesis, Education, The University of Queensland. Hoang, Viet-Ngu and Alauddin, Mohammad (2009). A new framework of measuring national nutrients balance for international and global comparison. 389, School of Economics, University of Queensland. Hoang, Viet-Ngu and Alauddin, Mohammad (2009). Assessing eco-environmental performance of agricultural production in OECD countries: combination of soil surface, soil system and farm gate methods of nutrient auditing. 399, School of Economics, University of Queensland. Tisdell, Clem and Alauddin, Mohammad (2009). Quantitative impacts of teaching attributes on university TEVAL scores and their implications. Working Papers on Economic Theory, Applications and Issues 52, School of Economics, The University of Queensland. Alauddin, Mohammad and Tisdell, Clement A. (2007). Factors That Affect Teaching Scores in Economics Instruction: Analysis of Student Evaluation of Teaching (SET) Data. Discussion Paper No. 353, School of Economics, University of Queensland. Alauddin, Mohammad and Tisdell, Clem (2006). Students’ evaluation of teaching effectiveness: What surveys tell and what they do not tell. Working Papers on Economic Theory, Applications and Issues 42, School of Economics, The University of Queensland. Headey, Derek D., Rao, Dodla Sai Prasada and Alauddin, Mohammad (2005). Explaining Agricultural Productivity Levels and Growth: An International Perspective. Working Paper WP02/2005, School of Economics, University of Queensland. Economic, social and environmental implications of shrimp-rice integrated farming systems in Bangladesh: A feasibility study.